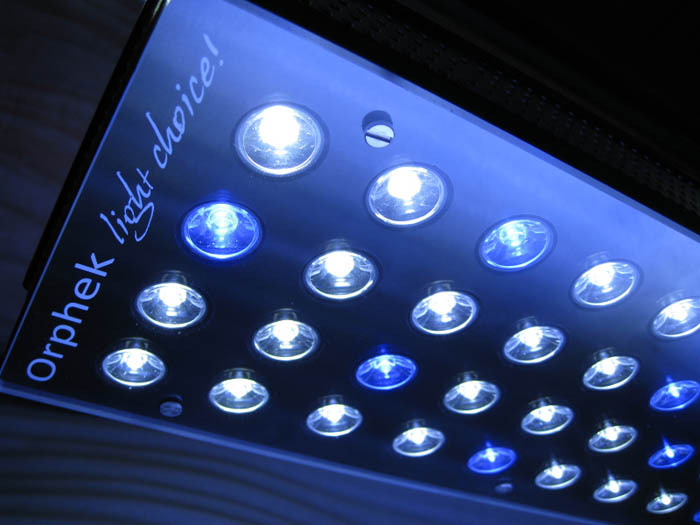 There is a lot of buzz going around the reef community about the Orphek PR-156 LED Fixtures. We are very impressed with what we’ve seen so far. 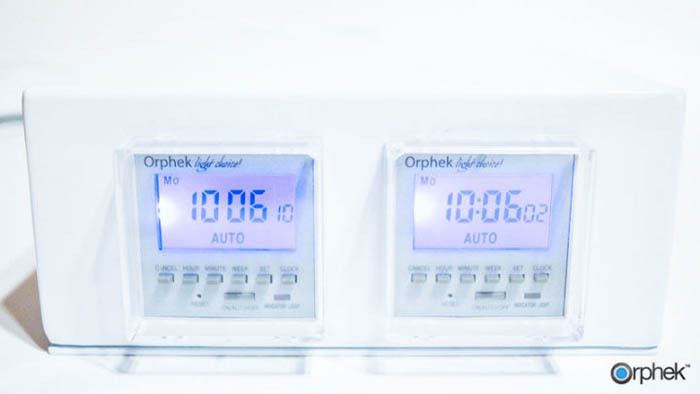 The Orphek PR-156 fixtures are packaged with dual timers and hanging kits. Not to mention they are very sharp looking, especially the white unit. Here are a couple of shots of these LED fixtures. Black acrylic/silver stainless steel grill/black power box. Orphek released 2 versions of the PR-156 and they have opened the phone lines to allow users to customize the ratio of white to blue LEDs. Additionally, Orphek is offering UV/true violet emitters for those reefers that enjoy the more fluorescent look making the colors of their Aussie corals really pop! The Power Reef PR-156 is designed to replace 250W to 400w Metal halides. This model was developed for deeper reef aquariums. It allows for higher mounting and increased spread with plenty of power. The Power Reef PR-156W (wide) is designed for shallower reef aquariums 28” or less. It also has worked well for aquariums with minimal space in the canopy utilizing 120 degree lenses creating a wider spread over shallower tanks. Take a moment to review the factory specs including spectrographs and impressive PAR readings. Designed specifically for the needs of photosynthetic marine invertebrates. Is a very powerful LED Light Solution that can replace 250w – 400w MH lights. Optional clear 90º or HONEY COMB 120º lens (PR-156W model). PR-156W is recommended in most cases. Advanced optics technology to reduces water surface refraction and reflection. The Spectrum of our Power LED helps to control algae overgrowth, by reducing algae proliferation on the front glass. Plug in plug out technology enables replacements or removal of components very easily, with no stress or damage to the product. Comes with two high quality digital timers with 16 memory programs, to simulate sunrise and sunset. Sleek modern design offered in 02 color options. Manufactured to exceed a 10-year lifespan, with only 10-15% luminous decay over that time period. Reduces up to 50% of energy consumption. Fan works quietly at 2000prm-20dbA. *Extension cables available at additional cost. Ratio: 70% of white: 30% of blue Power LEDs OR 60% of white: 40% of blue Power LEDs. 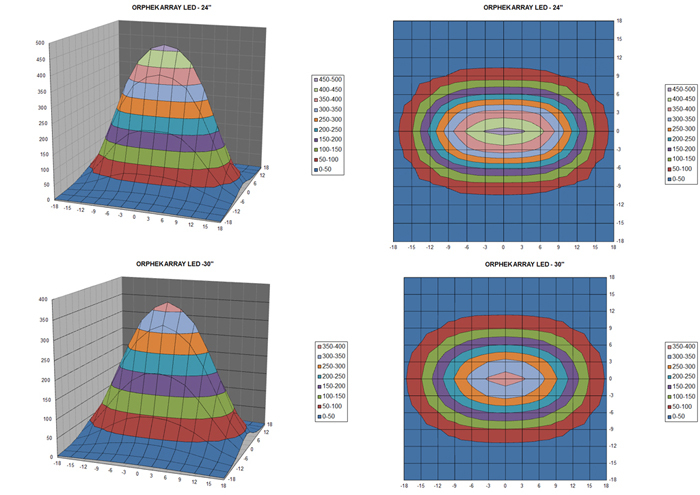 PAR TEST READINGS – By Sanjay Joshi, Ph.D.